It's hard not to feel moved at the end of Meredith Finch's Wonder Woman Vol. 9: Resurrection. At the same time, most of the emotion stems from our existing feelings for characters created by others, and not necessarily work that Finch does herself. The ending is controversial, to be sure, and I can't decide if Finch gets it right or not; it's a dubious distinction to suggest Finch's ultimate take on the characters might be colder than Brian Azzarello's previous, but it seems to be the case. As before, the problems of the story are mostly in plot leading characters and not vice versa; Wonder Woman herself comes off impossibly naive. And while I'm glad to get a glimpse of Greg Rucka's upcoming work on Wonder Woman, about which I've heard good things, Finch's story ends quickly and Rucka's Rebirth special raises more questions than answers, leaving the entire book feeling unfinished. Of a pair of controversial surprises in Finch's last chapter, I actually thought the revelation of Hera as the book's true villain was the most shocking. In Azzarello's run we saw Hera go from Wonder Woman's enemy to friend, including the goddess Hera's stint as a mortal; now we find Hera hastening the death of Zeke, the baby Zeus, in order to take Olympus's power for her own. Arguably the Olympian gods without conflict aren't that interesting, but I'd really bought into Hera as Diana's ally, something I'd venture Azzarello did actually intend. Even so, the nature of these gods going back to myth is to be more duplicitous than honest, so I tend to think Finch got it right. Still, it's an awfully dark place for Finch to leave her run, arguing against the existence of any real redemption in the world; this plus a variety of unresolved plot threads suggests the end of Finch's run came sooner than planned. The other surprise is Zeke's death. While knocking off babies is perhaps a bridge too far for mainstream superhero comics, this one was a little easier to see coming, if not now than eventually; I frankly would have expected Zeke to become full-grown Zeus at the end of Azzarello's run. Equally we can't know if Finch had some editorial mandate to restore the gods to more recognizable form before the next creative team took over. But it seems to me there's not much narrative difference between Finch having Zeke "die" and having his mother Zola be wrecked, or having Zeke transmogrify into Zeus in a burst of sparkles, thanking Zola for being his mother and promising always to be with her, and here it definitely felt like Finch took the dark path unnecessarily. There's copious examples of repetition and the characters telling instead of showing. As early as the first chapter, Diana emotes on US/Russian relations three times in two pages and the art tends to focus on Diana's face as she describes to the reader things not drawn. Leaps of logic abound, like the Secret Service trying to stop a biological weapon by covering it with a coat, or a villain claiming a drug-addled mob "won't stop" attacking Diana only to have them cease on their own a page later. Inasmuch as threads like Eirene's love for Ares and Apollo's new paramour are lost in the book's end, I did appreciate that Finch gives Donna Troy a spotlight back-up story. But again, unfortunately, the concept is better than the execution. We end up with a rather tangled fourteen-pager in which Donna saves a boy from drowning even as, with her fate-powers, she foresees he'll rob a bank; indeed he does rob the bank and kill a teller, but later three girls who were kidnapped by the teller are saved. There's a reductive moral here of "good things com[ing] from dark places," as on the nose as much of the book; there's moments where the dialogue seems to explain away the characters' actions as if the story was written in "Marvel style" with the dialogue added in after the art. The DC Rebirth "preview" included here is indeed Greg Rucka's whole Wonder Woman: Rebirth special. For a long-time DC fan, there's base excitement in some of Diana's "visions," including imagery from Rucka's pre-Flashpoint Wonder Woman run and also Superman in his pre-Flashpoint costume. At the same time the issue is in some respects less story than thought piece, comparing and contrasting Diana's pre- and post-Flashpoint origins without much explanation, with some shade thrown on the latter that's not wholly appealing. 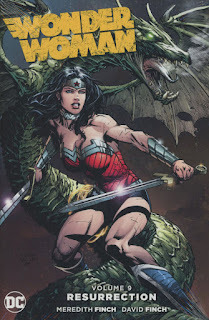 A full tally of Greg Rucka's Rebirth special should probably be saved for when it's in context with Rucka's first issues, but as someone who found merit in Diana's most recent origins, I'm eager to see Rucka give it some deference (though my inclination is to trust Rucka with Wonder Woman irrespective). Meredith Finch's Wonder Woman Vol. 9: Resurrection is perhaps the most viable of Finch's run, with a cogent, threatening villain that feels true to Wonder Woman and conflict that encompasses what came before. It muddles a bit in the middle with tangential quests and needless fights, but again, the conclusion had my attention. Art here by David Finch is better than Wonder Woman Vol. 8: A Twist of Fate, with well-drawn action sequences and splash pages and also inkers who emphasize Finch's art clearly. To be sure, I'm eager to get on to Greg Rucka's Rebirth run, and moreover to get past some of Rucka's scene-setting and arrive at Rucka just telling good Wonder Woman stories. Hopefully sooner than later.